If you were to ask a much younger Bart McClaughry if he enjoyed public speaking, chances are the answer would have been a resounding."No!" "At first I didn't agree with him and I didn't like it one bit. Then I developed a strong fondness for speaking to groups and I have had it ever since." Local historian and blogger McClaughry will be speaking at the 120th Reunion of the Bates County Old Settlers Society on Wednesday, Aug 23 at 1:00 P.M. where he will discuss pre and post-Civil War Bates County and how the railroad helped the area prosper. He has recently discussed area history at the 2017 Rich Hill Alumni Banquet and gave a brief presentation during the Fourth of July celebration. McClaughry finds the stories of Rich Hill fascinating and says the history of the town is often stranger than fiction. "In my years working for the City of Rich Hill." I have often wondered when working on different projects, how things got this way? 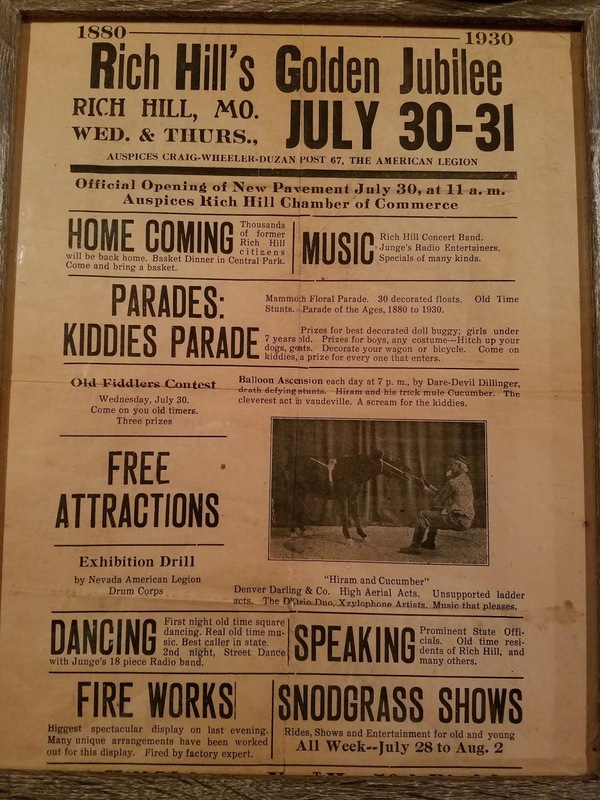 You can still look at Rich Hill's City Hall building on the east side and see a faint image where the door used to be,which they used to take the horses and the fire pump in and out of the building. "You can look at the old power plant building on Maple Street and on the west side,"he continues,"and still see the doors where they used to shovel the coal in to run the steam powered generators. Another example is when you read about the baseball field, you find how excited everyone was to have an actual ball field built so they would no longer have to play ball in a cow pasture." McClaughry keeps an online record of area history through his blog, "Rich Hill Missouri History." There he shares interesting articles and photos from old newspapers clippings and books. He says,"It is very rewarding to have people contact me and state how much they appreciate the blog, the interesting stories and historical information posted on it." McClaughry invites interested readers to share his passion at the 120th Reunion of the Bates County Old Settlers Society on Wednesday, August 23, at 1:00 PM. in the old Butler gym, which is air-conditioned. 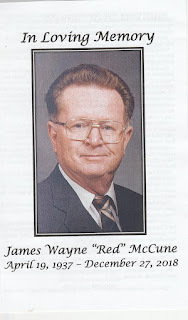 Wayne"Red" McCune of Rich Hill, MO, passed away on December 27th, 2018.Wayne was born on April 19, 1937 in Nevada, MO, to Virgil Franklin McCune and Jessie (Osborne) McCune. His early years were spent in Nevada, MO. before moving to a farm in Walker, MO. in 1943. He attended high school in Walker and graduated salutatorian with the class of 1955. Wayne's graduation was his second date with Wanda Emerson. 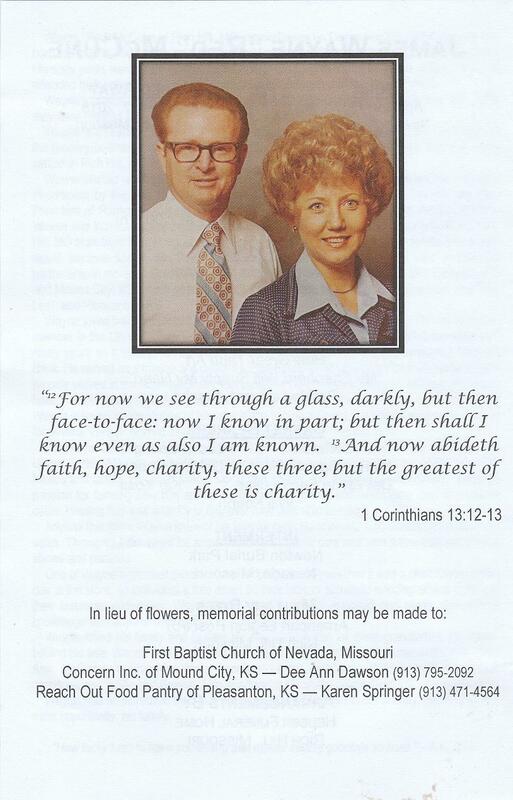 By December 28th, 1958 they were married and remained married married for almost 60 years until his death. Wayne and Wanda made their first home in Eureka Ks.In building Wayne's experience in the grocery business, they moved to Emporia, KS, Nevada, MO., Springfield, MO, and finally settled in Rich Hill, MO. in 1972. Wayne started working in the grocery business as a teenager. He managed his first meat department by the age of 20 and his first grocery store by 24. By 1970,Wayne was Vice President of Ramey's --a large grocery chain based in Springfield, MO. 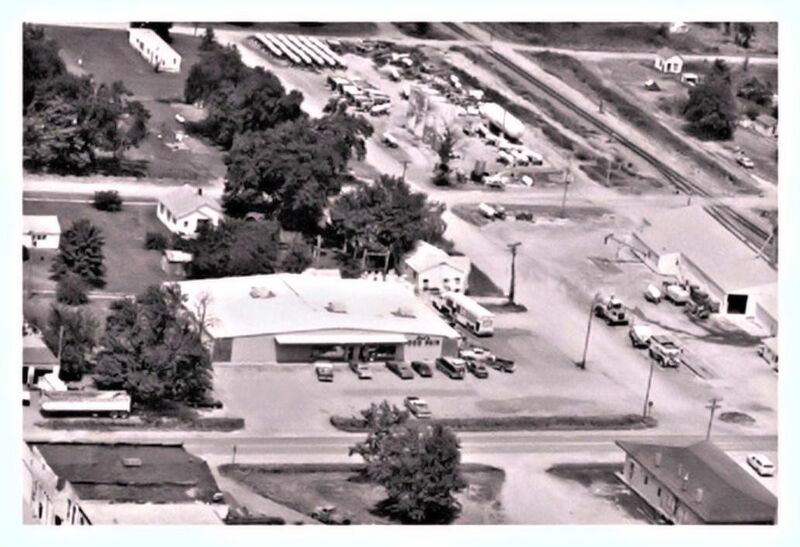 In August of 1972, Wayne and Wanda fulfilled their dream of owning their own store when they bought the Rich Hill, MO. store from Fred Marquardt. This is where they would settle with their family and Wayne would become known as "Red". Throughout the years, Wayne would own a share of partnership stores in Golden City, MO; Lamar, MO; Butler, MO; Nevada, MO; LaCygne, KS and Mound City, KS (which both began as joint ventures with longtime friends Fred and Billie Lee), and Pleasanton, KS. Wayne loved being involved in his community, his church, and his country. He was an active member in the Lion's Club, spent two years as President of the Chamber of Commerce, and many years as a director on the board of Security Bank of Rich Hill and eventually Citizen's Bank. He served as a Trustee and Deacon for the First Baptist Church for over 25 years. Wayne proudly served in the National Guard; first based at Camp Clark in Nevada, MO and eventually based at the Springfield Aviation Repair Depot where he became a helicopter mechanic. Wayne enjoyed telling stories of his time in the National Guard like when he became a driver for several VIPs or worked as a cook and earned the name "Pepper Red". Wayne had a variety of hobbies. He enjoyed traveling and took his family all across the United States. He was an avid water-skier and boater and spent many days on the lake with friends and family. He loved slalom skiing and sharing the experience with others. 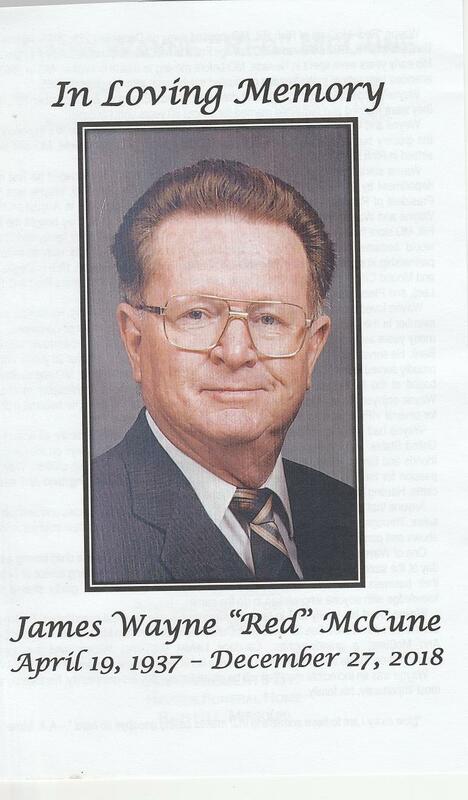 Wayne's passion for farming saw him spend many years acquiring and developing land and raising cattle. Hauling hay was a family outing everyone was able to enjoy. Anyone that knew Wayne knew of his love for cars. He attended auto shows and antique car sales. Throughout the years he acquired several classic cars and won a few trophies in local shows and parades. One of Wayne's greatest passions was helping others--whether it was a child having a bad day at the store, an individual a little down on their luck, or someone needing advice or help in their business endeavors. Wayne knew what it took to succeed and gladly shared that knowledge with anyone who wished to do the same. Wayne loved his family and in later life savored his role as great-grandfather. He leaves behind his wife: Wanda Sue (Emerson) McCune; a son: Bruce Allen McCune; a daughter; Beth Ann McCune; a granddaughter: Candace LeAnn (McCune) Wilson; and two great grandchildren: Bailie and Bryson. Also surviving is his sister: Joyce Trujilio of Cheyenne, WY. Wayne was an incredible man that will be greatly missed by his community, his friends, and most importantly, his family. Hi Bart, I love your blog. Have for years and I applaud your efforts with it. 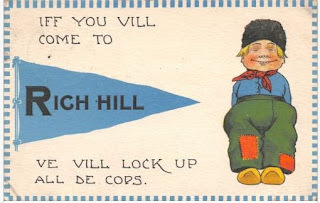 Attached are some matchbooks from Rich Hill. The Bo-Peep Motel is one I'm very curious about! Also is a strange RH postcard from 1913, front and back. I cribbed these from eBay. Feel free to post them if you'd like. Among the early settlers was a man by the name of O. Spencer, a well educated man from Kentucky and a Methodist minister, who had a love of fine horses. He settled on a farm near Rich Hill, where he divided his time between farming and preaching. Later he became engaged in the coal business and began breeding fine race horses. Many of his horses won recognition on the great tracks of the country. 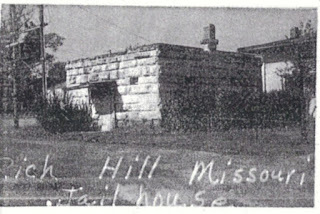 He was instrumental in establishing a race track in Rich Hill which became one of the best known tracks in the country. Mr. Spencer was a good friend of Major G. I. Lynch, who resided in Butler but owned and operated a deep pit mine in Rich Hill. His operation was known as the Bates Coal Company. There was a track running into the mine and the coal was hauled out in coal cars by a small donkey. Mr. Lynch, from Boston, was also a lover of fine horses so the two had much in common. The race track became part of the large fair ground on the east edge of the city. So that the cultural aspect of the city would not be neglected, a library association was organized and incorporated August 12, 1882. W. T. Tygard was elected President; S. Cain, Secretary; and S. G. Morrison, Librarian. They started with one hundred books. In 1974 the library is still in operation with books and __________________________________ an adequate supply to meet the towns needs but they proved to be disappointing, so he built an artificial gas plant that made enough to light the city. 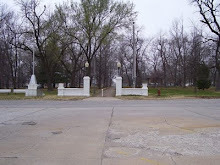 A double row of gas lights with large white globes decorated Park Avenue from the entrance gate on the east park to Park Place on the west. It was a beautiful sight when lit at night and was heralded far and wide as the “Great White Way”. Later, electricity was brought in and the town was a blaze of light! Ad to those already listed a cigar factory, an ice and refrigeration plant, two wholesale beer houses and a daily newspaper, The Rich Hill Gazzette, which was started August 5, 1880, by George P. Huckeby. It was republican and was started with the promise that a postmaster job would be granted him to assure a living. Of course, the picture couldn’t be all this rosy. Many of the miners brought in were of foreign descent and great beer drinkers. There were man from Belgium, Austria, Italy, Wales and Ireland. At one time there were seven saloons doing a thriving business. The miners worked hard, drank hard and played a bit rough! It was a wide awake, rootin’ tootin’ western town in the evenings when the miners were in between shifts. On Saturday nights, which was pay day, there was usually a fight or two, with possibly a knifing and occasionally a shooting so a jail house became a necessity. It is still standing, and in use, when necessary. It looks as though it could do a good job of corralling the boistrous and unruly. It looked so stout and dungeon-like that we asked to view the interior. So several of us ladies were given a personal tour by the present police officer, Lester Fenton. We found it to be swept clean, in fore ways that one. It was scrupulously clean, painted white and very bare! There were four cells with iron gates. One cell contained a stove, another was the toilet room, and two were reserved for prisoners. Each contained a bare bed made of bars and a folded blanket on each. The bull-run, or large room you enter was for any females who might be brought there, and contained two bunks spread with blankets. The small openings called windows, seen in the picture, were hidden by a lowered ceiling, so one could not see the sky, and the walls were of stone, hewed at least eighteen inches to two feet thick. About the only thing any one could do in such confinement would be to repent of ones wicked ways and vow never to get caught again! When the Tigers traveled to Adrian Sept. 7, only the “original 12” were eligible to play. “I fully expected us to get clobbered,” Denny admitted, “But somewhere along the line the kids didn’t expect it.” Rich Hill lost 13-0. Adrian finished the season at 7-2.The Tigers practiced Saturdays and Sundays to get in the allotted number of sessions so the rest of the players would be eligible to play the second game. They fell to Windsor 7-6 in game two. Then Midway came to town. The Vikings, of course, are defending Class 1-A state titlists. Midway won 13-0, but it was only 6-0 until the closing seconds of play.“Midway didn’t play very well,” Deny acknowledged, “I think (Midway Coach Laural) Hobick’s a tremendous coach. It’s an honor to be on the same field with him.” The Midway loss was a costly one. Doug Isaacson, the Tigers’ talented running back, broke a bone in his shoulder, but Phil Kesterson stepped in for Isaacson and picked up over 800 rushing yards in 6 ½ ball games. The freshman really came through,” Denny said. Freshman quarterback Tom Sutcliffe and classmate Brain Tabor teamed for the winning score in the 34-28 victory over Osceola- Rich Hill’s first. The same duo accounted for the go-ahead score in their 20-6 victory over Miami. I think we have super kids here,” Denny said. “The kids deserve all the credit. Maybe he was being a bit modest. The former Lillis High School mentor should be commended for motivating his youngsters to “give their all. Following a 44-0 victory over winless Kansas City West Friday, the Tigers finished the year at 4-6. Included among their victories was a 12-7 triumph over the Archie Whirlwinds- contestants in the Class 1-A state play-offs. Rich Hill is a town in Bates County, Missouri. The population was 1,461 at the 2000 census. 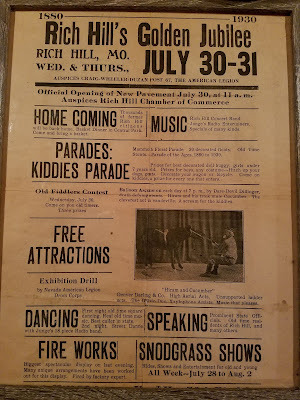 Rich Hill is known as the “Town That Coal Built” The purpose of this Blog is to give some history of the town through old newspaper articles, history books, and other history sources.